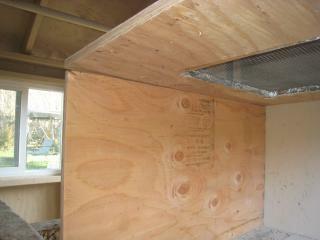 First we measured (and remeasured), cut and screwed the inside back wall into place. Then we cut out the "moonroof", foiled, and stapled the wire into place. 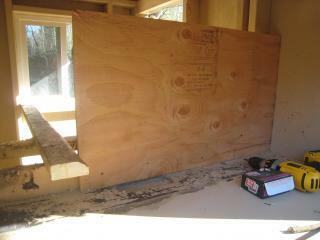 We also had to cut out the left back corner to fit the coop framing post. Then we screwed the top on. Here's a view from the underside. Then we cut the 3rd wall and screwed it into place. 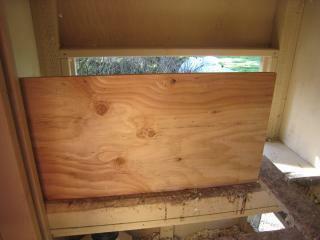 Notice the notch we cut out of the egg door so the plywood could come right up to the edge. 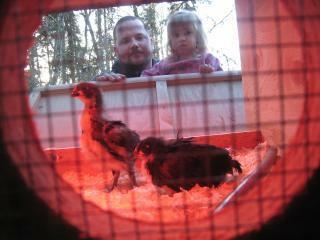 Chicks are small and we didn't want them squeezing through to the nesting box side where they could get hurt by our existing flock. 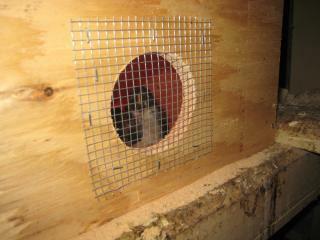 A closer view of the peep hole so you can see how we cut, wired, and stapled it. 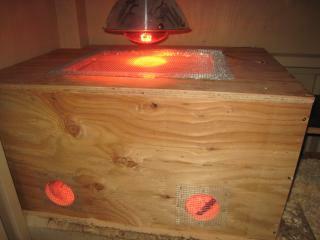 Here's a view of the finished brooder both from inside and outside of the coop for comparison purposes. 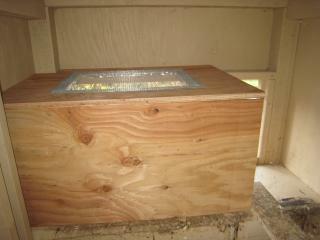 I like the idea of converting unused nesting boxes into a brooder. 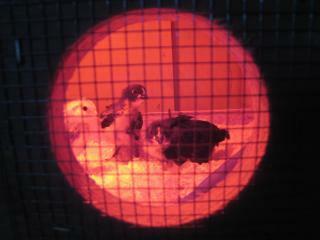 The use of a heat lamp in the coop makes me a bit nervous. 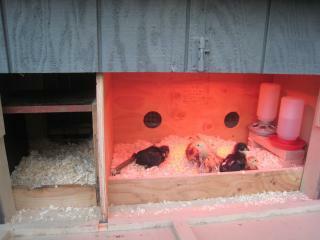 I really like the idea of a brooder in the coop. This article is very helpful for someone else who is thinking of doing the same. 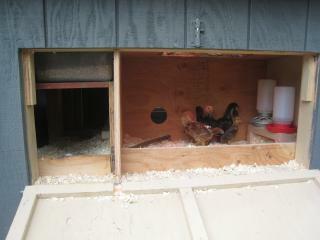 Great idea!I have 12 nest boxes and, you guessed, hens use 3! 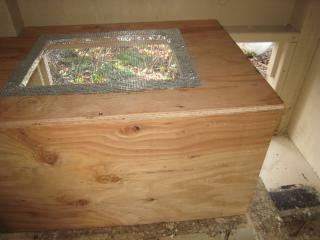 I am converting the entire top tier to brooding box which makes sense with heat in Texas, I should not have any worries about it ever being to cold for chicks, up there. I'll let you know how it goes. How long could they stay in this? What did you do once they outgrew this area? This was just one nest or did you take up the other two nest boxes for them and left the other one for your hen? Some guys have all the luck. Your own peephole for looking at chicks 24-7.. I really like this one. Thank you for all the details and clear pictures! I could totally do this with my coop! Thanks for the great ideas!